Educational courses provided by the Friends Neighborhood Guild took a variety of forms in the mid-twentieth century. Adults could meet at the Guild's community center for vocational training, night-school classes, discussion groups, and reading clubs. The Guild offered daycare services for children of neighborhood families with working parents and an after-school study space for students. 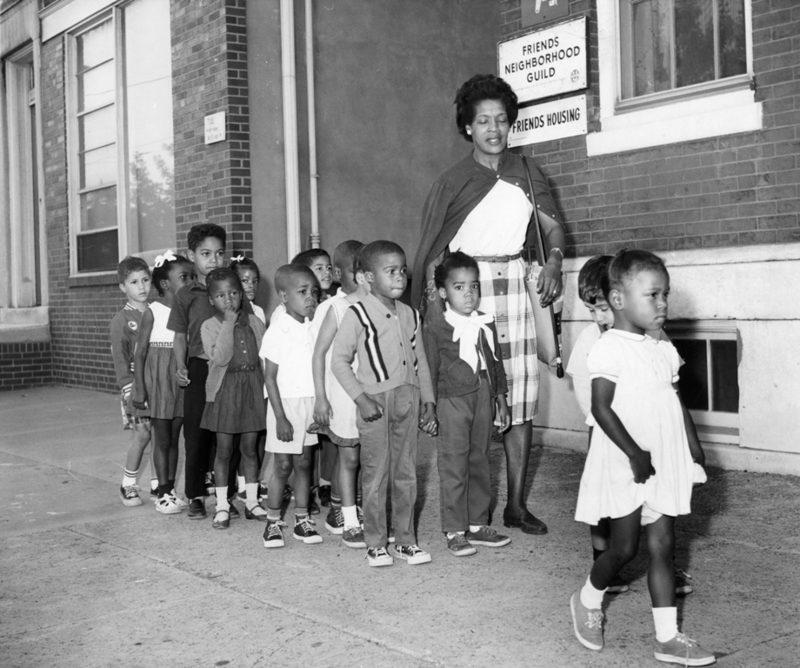 The daycare class in this 1965 image was photographed outside the Guild's building on Eighth Street just before a field trip to Abington, Pennsylvania. As part of its mission to promote better racial and ethnic relations throughout the community, the Friends Neighborhood Guild worked with the local Puerto Rican population to develop programs to help strengthen the community and bring positive exposure to the steadily growing migrant population. The guild, in conjunction with the Latin American Legion Post 840, helped establish Boy Scout Troop 310, led by a Puerto Rican scoutmaster. 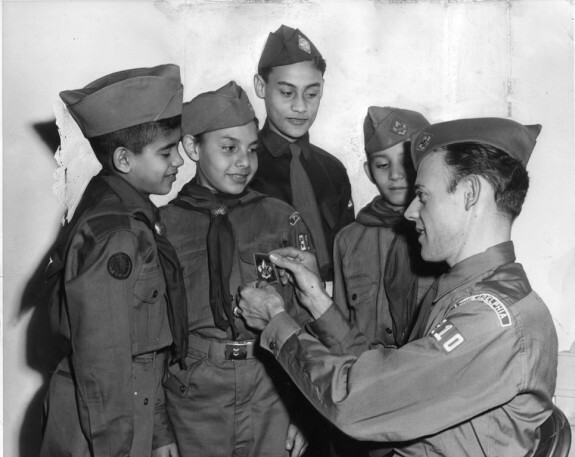 The troop was composed of boys who were Puerto Rican or of Puerto Rican heritage and for whom Spanish was their mother tongue. The guild provided meeting space for the troop and financially assisted programs and regalia for the members. 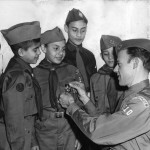 Pictured here at the official first meeting of Troop 310 in March 1955, Scoutmaster Pablo Adrono awards scouts the badge of Tenderfoot, the beginning rank. To answer the community's call for additional housing for low-income senior citizens, the Friends Neighborhood Guild and Robert Venturi developed a modern building for an older audience: the Guild House. Venturi, raised as a Quaker, was a pioneer of postmodern architecture and was teaching architecture courses at the University of Pennsylvania when he was commissioned to design the Guild House in 1960. 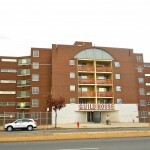 The design was made to reflect the brick style of other public housing and settlement homes in Philadelphia while displaying shapes and visual illusions that make the building unique to its surroundings. Consisting of 91 apartments across six floors, the Guild House opened in 1964. The Friends Neighborhood Guild has continuously operated and improved the building over the decades. In 2009, Venturi's architectural firm, Venturi, Scott Brown and Associates Inc., was hired to drastically renovate the interior of the Guild House for modern amenities and equipment. The nine-million-dollar renovation also paid for exterior changes such as new windows, exterior cameras, and replacement bricks. Friends Neighborhood Guild, a Quaker-founded settlement house and neighborhood center in North Philadelphia, for more than a century has helped residents confront urban issues by offering services, participating in neighborhood redevelopment, and acting as a broker for interactions across ethnic and class lines. Established in 1879 as Friends Mission No. 1 at Beach Street and Fairmount Avenue, the Guild began as a Quaker outreach effort to immigrants and children working on the waterfront. By 1880, the mission offered a night school for boys, a sewing school for girls, and temperance meetings. The mission’s goals overlapped with the emerging settlement movement, and the institution increasingly focused on helping immigrants to adapt to urban life. In 1899, the mission changed its name to Friends Neighborhood Guild and relocated to 151 Fairmount Avenue. Throughout the first half of the twentieth century, the Guild provided vocational training, recreation, and health services. Demand for services outgrew facilities at Fairmount Street, and in 1913 the Guild moved to Fourth and Green Streets, where it continued to serve portions of the Northern Liberties, Poplar, and Ludlow neighborhoods. The Guild sought to help residents of all backgrounds and promote better racial and ethnic relations. While it had earlier served European immigrants, by the 1920s changing residential demographics made African Americans a sizable Guild constituency. By the early 1950s, the Guild also provided an important meeting space and resource for the growing Puerto Rican population and for displaced persons from Eastern Europe. As civil rights struggles developed, the Quaker-controlled institution faced demands for greater local influence, which eventually resulted in community representatives holding half of the seats on the Guild’s governing board. Under the leadership of Francis Bosworth (1905-83) from 1943 to 1967, the Guild became more involved in neighborhood and community development. The Guild took an advisory role in East Poplar urban renewal efforts and launched Operation Poplar to address juvenile delinquency. Increasingly concerned about the scarcity of affordable housing, in the 1950s the Guild partnered with American Friends Service Committee to develop Friends Housing Cooperative at Eighth Street and Fairmount Avenue, where the Guild relocated its offices once more. The racially integrated cooperative housing development allowed families to buy dwellings with low down payments and sweat equity. 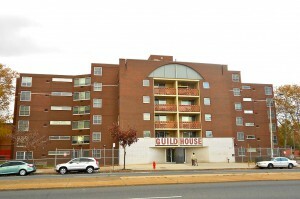 In the 1960s, the Guild completed construction of Guild House, an apartment complex for the elderly, at 711 Spring Garden Street. The Guild also facilitated tenant negotiations with public housing officials and assisted rent strikes against private landlords. By the 1970s and 1980s, the Guild served a neighborhood impacted by deindustrialization and suburban migration. Remaining residents had high rates of poverty and unemployment, and the Guild offered more basic social services. As Philadelphia’s downtown-focused redevelopment continued, the Guild took leadership in opposing a commuter rail tunnel. 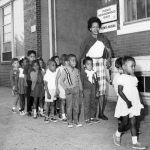 In the 1990s, the Guild offered energy assistance and began a Freedom School summer program. By 2011, the Guild, which had historically been supported by a mix of Quaker funds, government programs, grants, and United Way allotments, faced financial difficulties as these funding sources diminished. Nevertheless, the Guild continued to serve the area. Alyssa Ribeiro is a Research Scholar at UCLA’s Center for the Study of Women and teaches at California State University, Northridge. Bosworth, Francis. The Story of Friends Neighborhood Guild. Philadelphia: Friends Neighborhood Guild, 1950. Chastain, Sue. “Necessities for the Neediest: After School Care for Children, Heat for Homes, Food for the Hungry, The Friends Neighborhood Guild Helps with These in an Area Racked by Poverty.” Philadelphia Inquirer, November 14, 1990. Fuges, Mary, et al. The Story of Friends Neighborhood Guild. Philadelphia: Friends Neighborhood Guild, 1989. Haines, Pamela. “Friends Neighborhood Guild: A Quaker Presence in Philadelphia.” Friends Journal 52 (2006): 14-17. Trolander, Judith Ann. Professionalism and Social Change: From the Settlement House Movement to Neighborhood Centers, 1886 to Present. New York: Columbia University Press, 1987. Friends Neighborhood Guild Records, Special Collections Research Center, Temple University Libraries, 1210 Polett Walk, Philadelphia. Friends Neighborhood Guild Records, Friends Historical Library of Swarthmore College, 500 College Avenue, Swarthmore, Pa.
Friends Neighborhood Guild, 701 N. Eighth Street, Philadelphia. Friends Housing Cooperative, 703 N. Eighth Street, Philadelphia. I am looking for history and photos of the Friends neighborhood guild, which I attended in about 1954-1955 for day camps. I would like to visit archives. The site that I attended was located at 4th and greene sts. in Phila pa.